I can’t quite remember who recommended it to me but somehow entered Oxford Half Marathon with my husband and BVR runner Oliver. We have only had one weekend away without the kids in 6 years, so naturally we thought it would be a great idea to go away, carb load, have an early night, wake up at 6:30 to eat porridge and race till we felt like dying….and go home: a rather disputable taste when fun is concerned. This said, I am sure no BVR member will find this remotely strange! 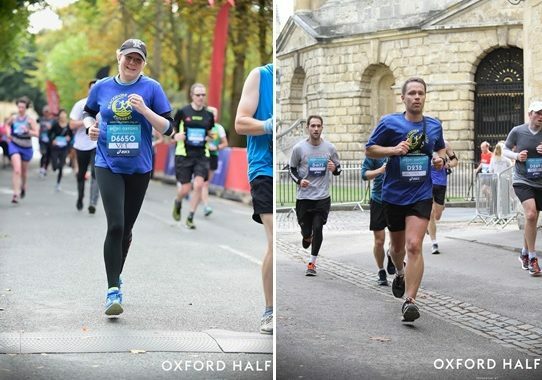 Oxford Half is organised by Virgin and is a big affair: ASICS as a main sponsor, 10 000 runners, celebrity guests, it feels like a proper major race. Small detail aside that they couldn’t get the medals through customs on time!! Despite this MAJOR hiccup, the event was really well organised. Plenty of toilets before and en route, lots of water stops, bands and music, complete road closure and more importantly a twisty but really fast course. Barely any elevation what so ever and the waves at the start made it quite easy to move about. There is quite a walk to the start (10/15min) and standing in the pen for a good 20min meant that I needed the toilet by mile 1.5… not really something I can blame them for but I wasn’t the only one with this predicament and would time things differently next time! Lots of crowd to cheer you on and some beautiful sights. Part of the course goes out of the city into the countryside, the rest twisted and turned into the town. I thought the out and back would be harder but I hadn’t studied the map and I was so lost I could only focus on the mile markers. I tried to stick with the 1:55 pacer but he was totally off pace and going way too fast so he soon left me behind. I found him in a door way in town clapping runners whilst watching his watch… he then rejoined the race just as I passed by. Cheeky but it amused me! The atmosphere was great! I would say very close to the Great South Run. We both ran a PB (1:57 chip/ 1:55 if I take the early wee-break off 🤣, Oliver ran in 1:41!!) and fellow BVR member Penny Webster got a 5th place in her age category with 1:58! The goodie bag was nice, made of fabric with lots of food. T-shirt was lovely too although I would have liked a long sleeve like the previous year. Photos are included in the event price which is a really nice touch and the race Village has lots of interesting stalls. I would definitely do it again. Not a cheap event but the very heavy and gorgeous medal (that arrived 2 weeks later! ), the goodie bag, big race atmosphere and PB potential were worth it.